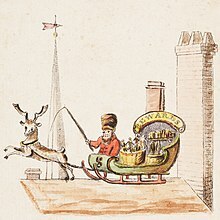 "Old Santeclaus with Much Delight" is an anonymous illustrated children's poem published in New York in 1821, predating by two years the first publication of "A Visit from St. Nicholas" ("Twas the Night before Christmas"). It is the first publication to mention (and illustrate) Santa's reindeer and sleigh, as well as being the first to describe his arrival on Christmas Eve. The accompanying illustrations are the earliest published artistic depictions of a Santa Claus figure. The poem, with eight colored lithographic illustrations, was published in New York by William B. Gilley in 1821 as a small paperback book entitled The Children's Friend: A New-Year's Present, to the Little Ones from Five to Twelve. The names of the author and the illustrator are not known. The book is believed to have been the first produced by lithography in the United States. Published in the same city as Washington Irving's earlier portrait of Santa Claus in Knickerbocker's History of New York, the poem may have directly inspired another New Yorker, Clement Clarke Moore, to create the modern Santa in "'Twas the Night before Christmas". Gilley's book includes some important elements in the early development of Santa Claus: his connection with the northern winter, the reindeer and sleigh, and his arrival on Christmas Eve rather than on 6 December (the traditional feast day of Saint Nicholas). The accompanying lithographs are the earliest images of a Santa figure. They show Santeclaus dressed in a red outfit and are the first reference to his being dressed in that color. Although red had been traditionally associated with bishop's robes, such as those that Saint Nicholas might have worn, the outfit shown is not that of a bishop, nor does it represent the old Dutch clothing of Saint Nicholas as described by Washington Irving and James Kirke Paulding. In contrast with the modern Santa Claus, Santeclaus leaves presents as rewards only for "good" children. "Naughty" children receive a "long, black, birchen rod" whose use for parental punishment is endorsed as a "command of God". Where peace and love have made their home. Others, that seemed for pigs intended. To blow their eyes up, or their pockets. With knowledge of each various kind. When virtue’s path his sons refuse. ^ "A New-Year's present, to the little ones from five to twelve". The Children's Friend. Broadway, New York,: Gilley, William B. III. 1821. ^ a b c Bowler, Gerry (2005). Santa Claus: a biography. McClelland & Stewart Ltd. p. 37. ISBN 978-0-7710-1668-4. ^ a b c Restad, Penne L (1995). "Christmas in America". New York: Oxford University Press: 203. ISBN 0-19-510980-5. ^ Hutton, Ronald (1996). The Stations of the Sun. Oxford & New York: Oxford University Press. p. 118. ISBN 0-19-820570-8. ^ Bowler, Gerry (2000). The World Encyclopedia of Christmas. Toronto: McClelland & Stewart Ltd. p. 199. ISBN 0-7710-1531-3. ^ Bowler, Gerry (2005). Santa Claus: a biography. McClelland & Stewart Ltd. p. 35. ISBN 978-0-7710-1668-4. ^ Restad, Penne L (1995). "Christmas in America". New York: Oxford University Press: 144. ISBN 0-19-510980-5. ^ Restad, Penne L (1995). "Christmas in America". New York: Oxford University Press: 54. ISBN 0-19-510980-5. This page was last edited on 3 March 2019, at 10:19 (UTC).